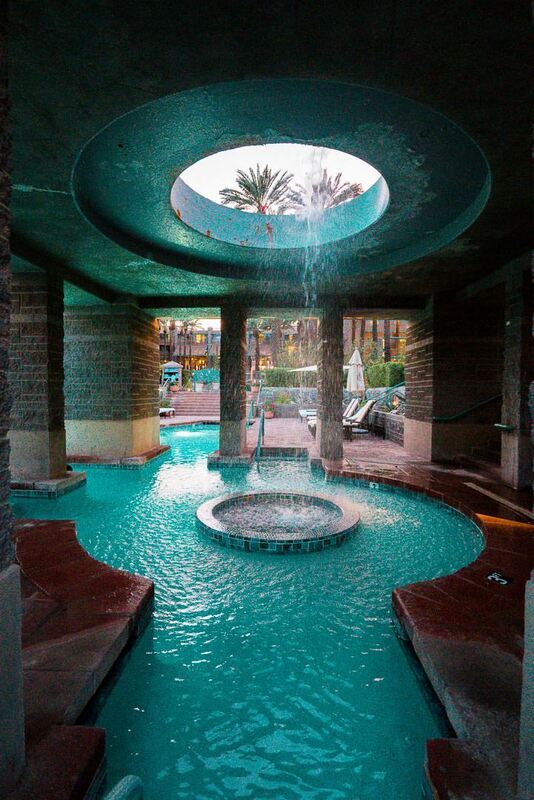 Spending time poolside is essential in Scottsdale and Phoenix. 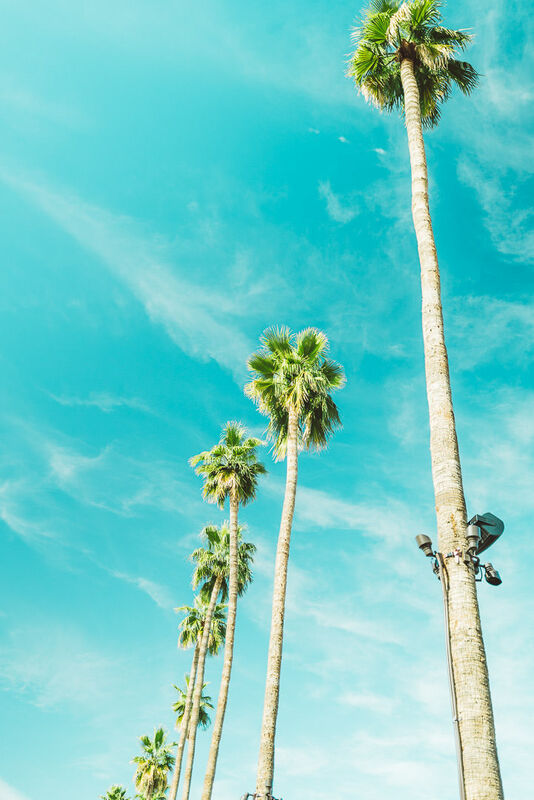 Here are the best pools Scottsdale and Phoenix have to offer and some even have day passes available. I’m also sharing a hotel with FREE entry even if you’re not a guest! 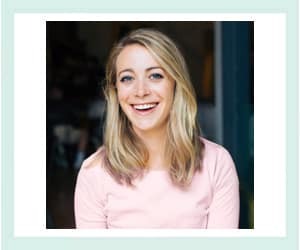 Read on for my exclusive guide. 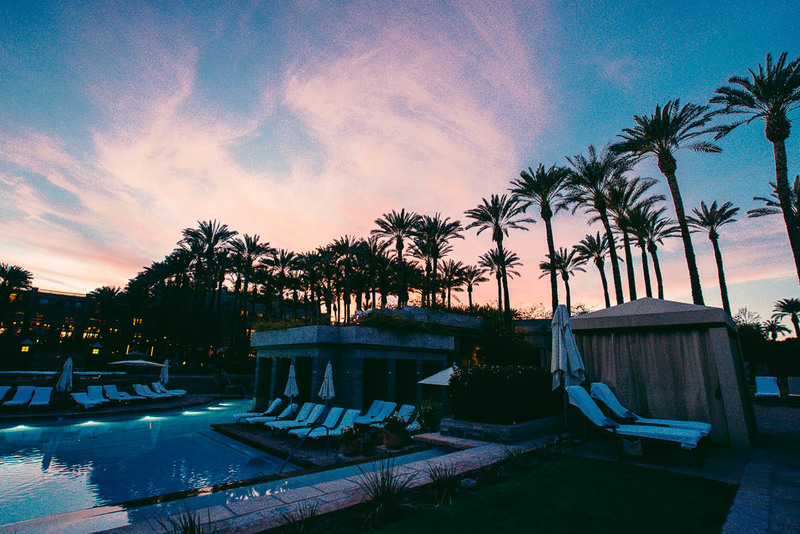 It’s hard to imagine a trip to Phoenix and Scottsdale without some serious time poolside. Even though we weren’t there in swimsuit weather, it was still warm enough to relax on a lounge chair and sip a cocktail. Luckily there are dozens of pools to choose from and for many of them you don’t need to be a hotel guest to get a day pass. 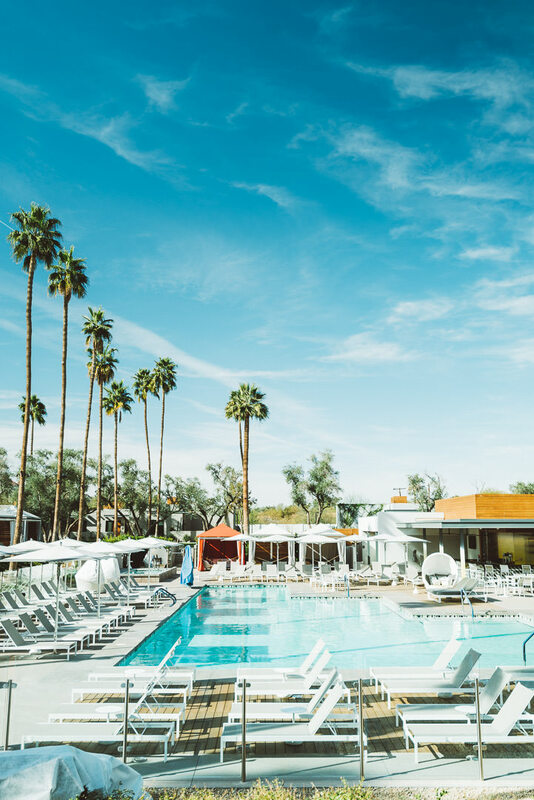 Of note, while I was researching visiting policies for this article, one of the hotels pointed me toward the website Resort Pass which sells day passes for many of the hotel pools in Phoenix and Scottsdale. This is definitely worth checking out if you’re staying at a hotel without a pool or renting an AirBnB on your trip. 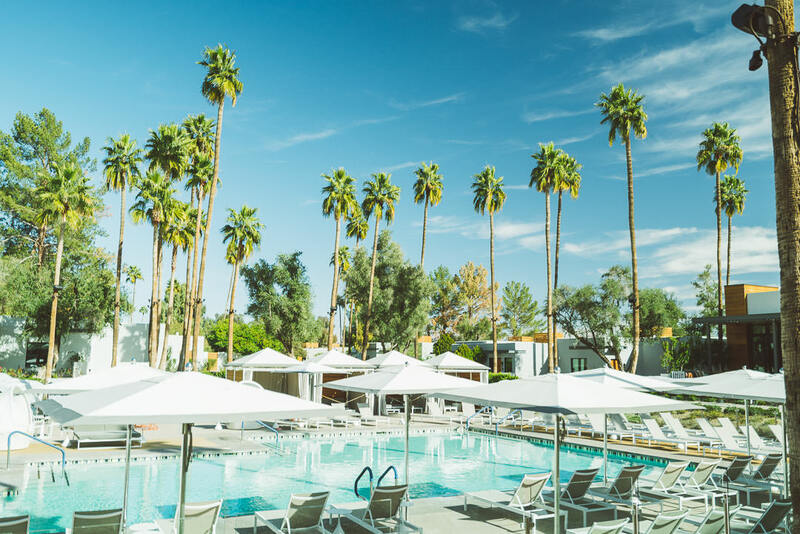 Read on for a few of our favorite hotels in Scottsdale and Phoenix! The newly renovated Phoenician Resort pools are totally modern and gorgeous while retaining that old school feel of luxury that you expect at the Phoenician. I love the neutral color scheme with pops of orange – it really makes that beautiful turquoise water pop! You also can’t beat the backdrop of Camelback Mountain and all the amazing dining options available at The Phoenician. If you’re traveling with children, they have a designated kid area with a suspension bridge, tree house, pirate ship, spray guns and more. Guests over 42 inches can also enjoy their 197-foot tall twisting water slide. Visitor Policy: Sadly open to resort guests only. We had an amazing stay so I would highly recommend booking a room at The Phoenician! I have truly never seen anything like the pools at Scottsdale’s Hyatt Regency Hotel. Their pools literally go on for as far as the eye can see. They have an incredible 10 swimming pools, 20 fountains, 45 waterfalls, and a 30’, 3-story high-speed water slide. No really. The property is truly beautiful as you can see from our time there at sunset. Pro tip: while you’re there, make sure you enjoy a gondola ride on Hyatt Regency’s private lagoon! Visitor Policy: Hotel guests only. Some day passes available for reservation on Resort Pass starting at $45 per person or $475 for a cabana (up to four people). Hotel Valley Ho has two pools depending on what you’re in the mood for. The OHasis pool is lined with palm trees and lounge chairs making it perfect for relaxing. 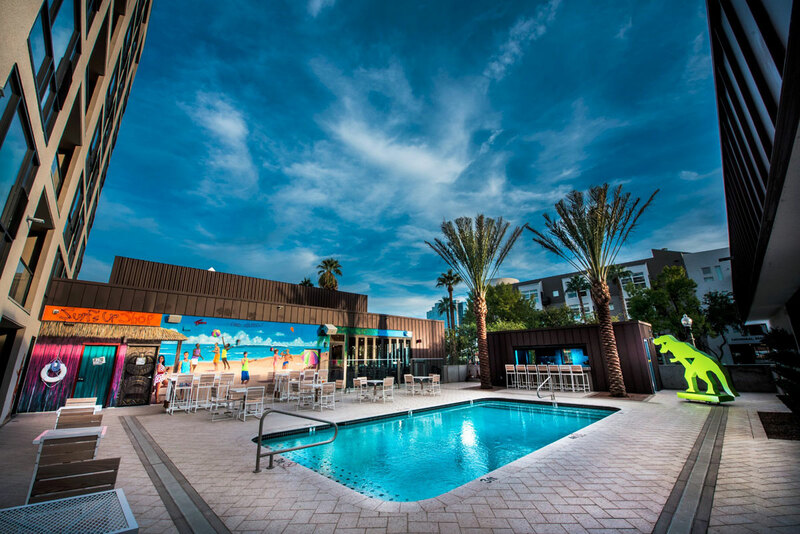 The OH pool is where the party is at and features cabanas, colorful retro pool furniture and poolside dining. 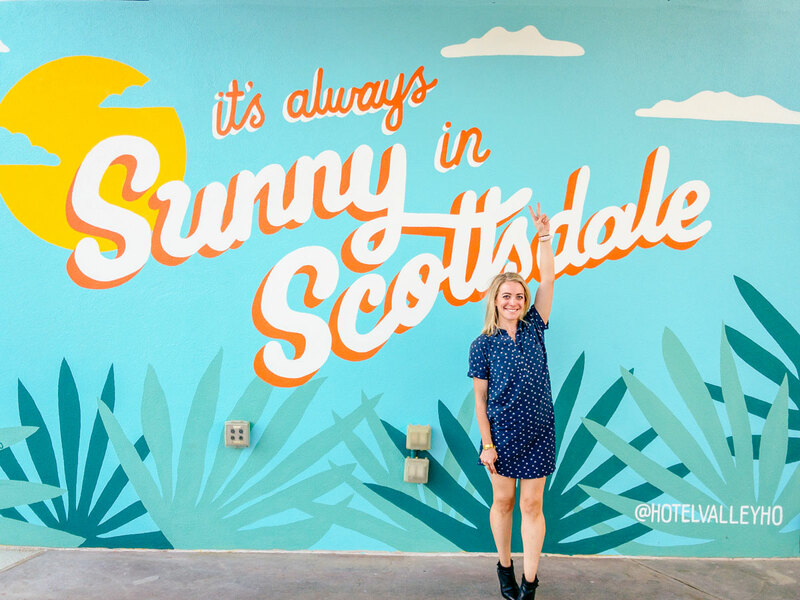 This one was so much fun – any pool that has a cheesy mural backdrop that’s perfect for Instagram is a winner in my book. 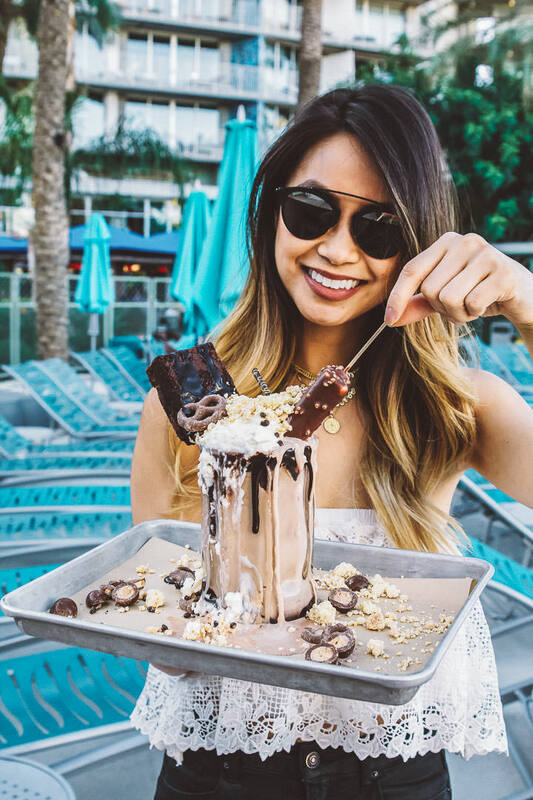 Pro tip: make sure you order the over-the-top Showstopper Milkshake from Cafe Zuzu while you’re there! Visitor Policy: March through October, all are welcome for dining at the OH Pool Monday through Friday. On Saturdays and Sundays, reservations for guest rooms, cabanas or daybeds are required for pool admittance. Daybed reservations on Resort Pass start at $79 (up to four people) and cabanas are $149 (up to eight people). Just like the rest of the hotel, the Found:Re Hotel pool is charming and quirky. Think colorful statues, bright murals and urban chic pool furniture. There’s no official visitor policy posted on the hotel website, but when I talked to customer service they told me that they do allow outside visitors to the hotel for FREE. Visitor policy: FREE even if you’re not staying at the hotel. No outside food and drink is allowed. Hyatt Andaz Scottsdale Hotel is a modern urban oasis. The Turquoise Pool is their main pool and they also have the quiet Palo Verde Pool available to spa guests. Early birds get the worm here as the Turquoise Pool offers a complimentary daily “delighter” (frozen alcoholic beverage) every day at 11:45 a.m. The hotel also features five poolside rooms outfitted with their own cabanas. To do some good while you relax poolside, you can reserve the (ANDAZ)RED Cabana. 30 percent of cabana rental fees will go to (RED)’s fight against AIDS. Visitor Policy: For hotel guests only depending on occupancy. A limited number of day passes may be available on ResortPass at $45 per person or $300 for a cabana reservation. P.S. – Looking for more Phoenix travel information? 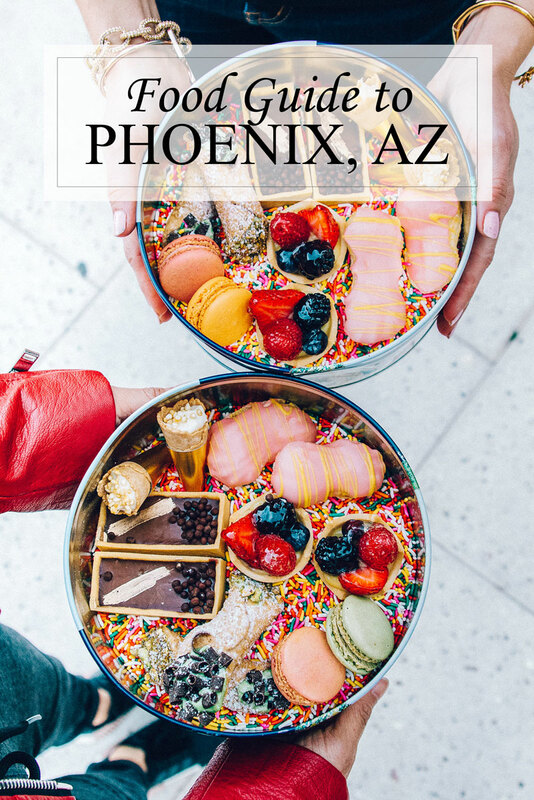 Check out my recommendations for where to eat in Phoenix! 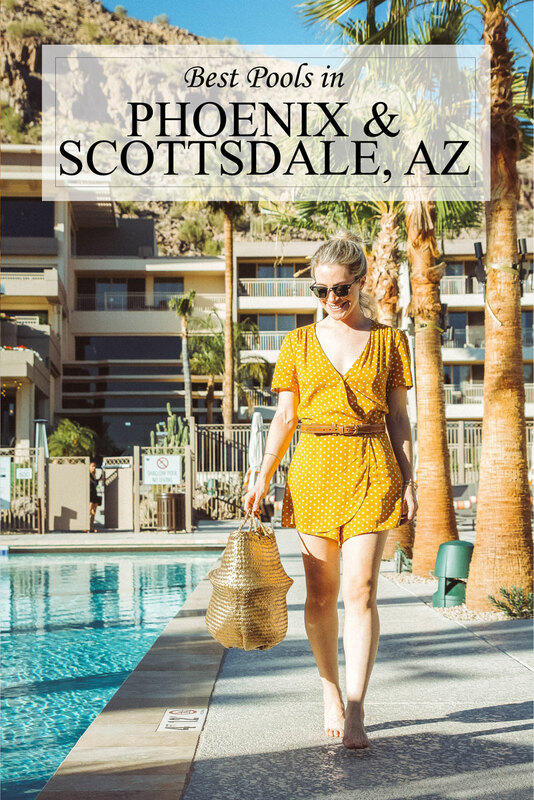 Headed to Scottsdale and Phoenix? Pin this pool guide for later! It’s really spectacular isn’t it?! I hope you are staying cool!